This ancient shrine, considered the top shrine in Oki during the Heian Period, is one of the four big shrines in the Oki Islands. Before the gate is a shallow cove, which is called "Ika-yose no Hama" (Squid Bay), where it is said that each year squid gather to ask forgiveness from the goddess enshrined there. 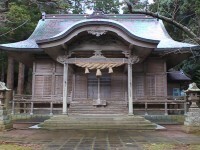 Along the inside of the shrine there are engravings of squid.